The most major factor of this paradox seems to be the pressures to be both academically stable and socially acceptable in our everyday lives. Every middle school student has at least an hour of homework on average per night. And by the time you’re in eighth grade this rate can climb to two or three hours. Combined with extracurriculars and sports requirements, plus simply being able to eat dinner at a regular time, some students have expressed the grievance of going to bed at 12 or 1 or later in the morning. This will make you sleep deprived and irritable (or more so than the usual Monday morning), more stressed out than normal and barely able to stay awake in class. Wait a minute—if we’re being pressured to complete every homework assignment, study for tests the next day, and meet the sports requirement—how will we be able to complete this cycle while being so incredibly exhausted from the previous night’s assignments? This enigma has puzzled many the middle school student. If I am up until 12 studying for my math test first period tomorrow because I got home late from my away soccer game, and I have to finish my history paper and my chapters to read for English class—then how am I going to wake up at 6am to catch the bus to actually make it to class? This simply does not make sense. If we are given piles of homework to do with having 2 required sports seasons, then on some days we might not be able to meet these high academic requirements. Yes, homework is crucial for learning and for good study habits, but there needs to be a deeper understanding and adjustment for the crushing workload and sleep deprivation that so many middle schoolers are facing. Stress. This one, generally thought to affect mainly middle-aged working people, is a weird thing to sometimes dominate a 11- to 14-year-old person. 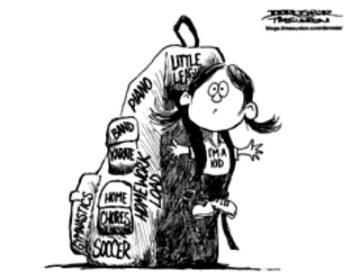 Stress should not be a main concern for a middle school student. Finishing an English paper or studying for a science test are stressful occurrences, but they should not be causing the amount of anxiety or nervousness that they do in a middle schooler’s life. This level of stress and sleep deprivation should wait until we are older; instead, all of this work seems to be rushing the amount of nervousness that we are faced with. Middle school students should not be needing multiple—or even one—cup of coffee to make up for their sleepless nights and stressed out brains. Middle schoolers should be given some time to relax, no matter what their schedule is like. We should be able to watch Netflix, read a book, stalk people on Instagram, go outside, go to bed at a reasonable time, and not be so stressed out.